The high-pressure washers with petrol engines are equipped with great power and are the best choice for carrying out cleaning work in workshops and industrial plants. In the catalog of Mister Worker™ you will find the top of the range: the Annovi Reverberi DXPW 010 E combustion machine. Purchasing a high-pressure cleaner online is not a simple task: there are numerous models available, and you have to be very careful to choose the one that is most suitable for the job you have to do. Mister Worker™ has recently added the famous Annovi Reverberi petrol-powered pressure washers, the best choice for professional use. 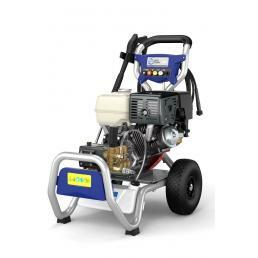 The key element to keep in mind when buying a pressure washer is the number of horsepower of the engine: in fact, it is precisely the horses that generate pressure and volume, and it goes without saying that the greater the number of horses, the greater it will be the pressure power of the pressure washer. If you need a petrol engine for domestic use, choose a model that has a power of 5 horses or a maximum of 110 V, while you need it for professional use, such as the cleaning of industrial plants or workshops, better if points towards the models of 10 horses upwards. In the Mr. Worker™ catalog you can find the top of the range: the Annovi Reverberi DXPW 010 E petrol engine high-pressure washer with Honda engine. It has a practical trolley with a handle equipped with anti-vibration feet and two wheels with rubber tread, which guarantee maximum stability and safety during use. The water filter and oil levels are inspectable, and has practical drain plugs and slots to simplify maintenance and oil changes. If you are looking for a petrol engine high-pressure washer, rely on Mister Worker™: in the catalog there is a wide selection of Annovi Reverberi high-pressure washers, ideal for professional use. Request a quote immediately by sending an email to [email protected]: our experts are ready to advise you and help you.